I love food and enjoyed some wonderful meals in December but have you noticed how large portions tend to be when you eat out? It’s a necessary one-size-suits-all approach; to the chef I could be a 6′, 25st bloke. He doesn’t know that I’m a 5’6”, 8½st woman. I’m often faced with enough food for two of me! But how much of it to eat? I teach people: when you’re hungry, eat; when you’re satisfied, stop. So whenever I have a huge meal put in front of me, I don’t try to force it all down. This was hard at first. Like lots of us, I hate to waste food. I was brought up with a strong plate-clearing culture and sadly this can lead to over-eating. When you eat more than you need, your body has to work hard to process and eliminate the excess – or store it as fat. Food that you don’t need is already waste whether or not you eat it. It’s better to save it for another time or even to throw it away than to treat your body like a dustbin. To break the habit, leave something very small at first eg a pea or a chip. 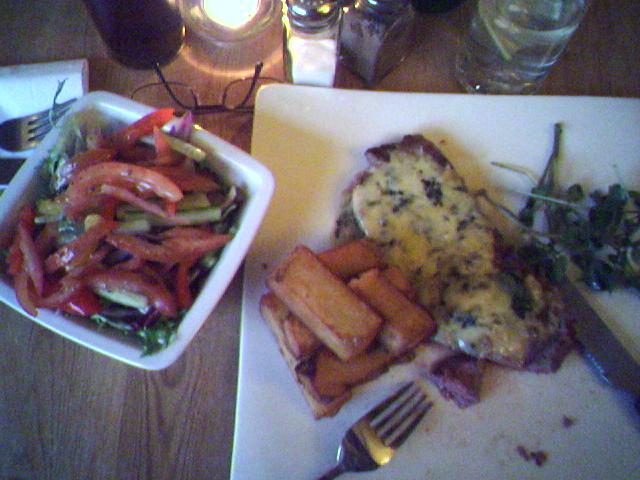 Actually this delicious meal at The Granville, Barford, was the right size for me! Here’s my strategy when eating out. I always decline any bread that’s offered. I usually ask for a half portion of potatoes (which sometimes works but often is ignored). I’m not embarrassed to ask for a doggy-bag. If I can’t have one, I leave the rest which is a shame but better than treating my body disrespectfully. So enjoy your food when you eat out and when you‘ve had enough, stop eating and put down your knife and fork. Top tip: Respect your body – don’t over-eat to clear your plate.